This article is about motorcycle sport. For the mountain biking sport, see Enduro (mountain biking). For other uses, see Enduro (disambiguation). Enduro is a form of motorcycle sport run on extended cross-country, off-road courses. Enduro consists of many different obstacles and challenges. 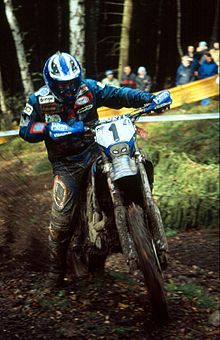 The main type of enduro event, and the format to which the World Enduro Championship is run, is a time-card enduro, whereby a number of stages are raced in a time trial against the clock. In a traditional time-keeping enduro, riders leave together in groups or rows, and each row starts at a certain minute. The object of the event is to arrive at pre-defined checkpoints according to a strict schedule. Early or late arrivals result in the riders' scores being penalized. Throughout a day there will also be allocated periods for refuelling and servicing the machine. Penalties apply for not meeting defined times or for outside-assistance when not permitted. A world championship course must be at least 200 km and a maximum of 30% of its length can be on paved roads. American Motorcycle Association (AMA) rules are different with respect to course length and other variables (i.e. average speed, terrain type, etc.). The rules of the regional sanctioning body can also affect the rules for a particular enduro course. 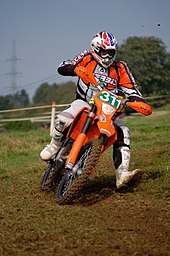 Casual observers often confuse the two different types of events, enduros and rallies, but within the international off-road motorcycle community, the term enduro traditionally refers specifically to time keeping events which require competitors to maintain a prescribed mile per hour average over varying terrain. Competitors are moderated by a series of secret time keeping checkpoints along the race course, and are penalized based on their arrival time to the checkpoints. Rallies, on the other hand, are run on point to point courses where the competitor with the fastest time between the two points being declared the winner. Such courses may be shorter than the total length of the race, in which case the course is repeated several times, with each repetition being referred to as a lap. Such courses may also be very long such that competitors never cover the same ground twice. In the US the rally format has greatly grown in popularity and is referred to as an "enduro" in many cases. The AMA National Enduro Series has used a similar format since 2007, referred to as "start-control / restart enduros". This format is believed to be more accessible for new riders by reducing the complexity of the race format in addition to making scoring easier for organizers. An enduro motorcycle is specialized for the nature of the sport, with the deep suspension of a motocross bike combined with the features required to make it legal for the public road portions of the course. Engines are generally single-cylinder two-stroke between 125 and 300 cm³ (cc), or four-stroke between 250 and 650 cm³ (cc).In 1973 Yamaha introduced a motorcycle for trail use which had the word enduro as a badge on it's side panels. The World Enduro Championship and several other championships currently categorize enduro motorcycles into three classes; Enduro 1 (100 to 125 cc two-stroke or 175 - 250 cc four-stroke), Enduro 2 (175 to 250 cc two-stroke or 290 - 450 cc four-stroke) and Enduro 3 (290 to 500 cc two-stroke or 475 - 650 cc four-stroke). The American Motorcycle Association is the primary sanctioning body for motorcycle races of all types in the United States of America. AMA series are often analogous to FIM series. The East Coast Enduro Association is one of the most prominent organizers of enduro races in the US. The ECEA has multiple classes divided by bike type and rider demographic that allow a qualified rider to choose a class to compete in. Each skill class (A, B, C) is divided into sub-classes depending on machine type, rider age, and gender. Some examples include "C 4-stroke," "C-Veteran (30+)," "B 2-Stroke Light," "B 2-Stroke Heavy," "Women's", etc... Generally speaking, there are rewards at both the event and season level for each sub-class (i.e., "I was the B 2-Stroke Light winner at this event..."). Classes include age brackets as high as 80+ (Legends class). Class AA - The most accomplished level of rider, same as "Class A,", but who competes for points as part of the AMA National Enduro Championship. For example, Mike Lafferty, who is the seven-time AMA national champion, competes in the AA class. Class B - This is the second level of rider skill (one step up from the entry level C-class). Riders are "promoted" by the AMA when they have received a certain number of points (promotion points are different from the points that are awarded during a race; points during a race are bad, as the goal is to finish an event with as close to 0 points as possible, whereas title/promotion points are awarded at the end of each event depending on how well each rider performed - the dual use of the nomenclature "points" can often be confusing to outside observers, because the connotation of having points during an event is negative, whereas the connotation of having points relative to a rider's standing in a series is generally positive). Class C - This is the entry level where all new riders begin. All riders start off as C-class riders and if they continue to participate in and finish events they will likely be promoted to B-class after two or three seasons. Exceptional riders will make the leap to B-class after their first season because they will have accumulated the requisite points quickly enough. In addition to races and series sanctioned by national associations, a large number of events are also held at the local and regional level by smaller governing bodies. In the US these events closely resemble AMA sanctioned events, utilizing the same A, B, C skill classes. Many riders begin their racing careers at events such as these. One example in the USA is the Grand National Cross Country, which more closely resembles hare scrambles, such as the Austrian Erzberg Rodeo than Enduros, but is on a shorter course of perhaps a few miles/kilometers in length that is repeated for several laps. GNCC is famous for the high level of ATV (four-wheeled off-road vehicles) competition in addition to motorcycle competition. Endurocross or indoor enduro is a variation of enduro held indoors. Riders must complete as quick as possible a course with obstacles similar to those in enduro. ^ a b c d "Enduro". americanmotorcyclist.com. Retrieved 10 February 2017. ^ "AMA Enduro Racing rulebook". nationalenduro.com. Retrieved 10 February 2017. ^ "Riding Your First Enduro". dirtrider.net. Retrieved 10 February 2017. ^ Association, American Motorcyclist. "Getting Started in Enduro". American Motorcyclist Association. Retrieved 2018-08-25. 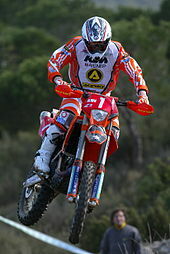 Wikimedia Commons has media related to Enduro.